A practical checklist to help parents and family members identify some important aspects of respect to talk about with children. 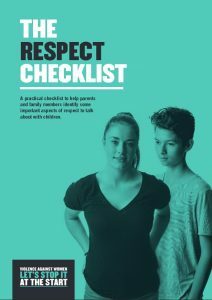 This checklist shows a range of views from girls and boys about respect. It will give you a picture of what your son or daughter might believe, and how they could react to disrespectful behaviour. Think about each statement and fill in the checklist based on what you know about your son or daughter. Your answers will help you to better understand your child’s views and will give you a place to start talking. That’s great, it seems like your daughter has a good understanding of respect. It’s important to continue the conversation. See the Conversation Guide for tips. The importance of respect between people, no matter what their age, gender or background. Having the confidence to speak out against disrespectful attitudes and behaviours. That male intimidation, humiliation or aggression towards females is never their fault, and should not be tolerated. The need to respect personal privacy and boundaries in relationships. These are important topics and issues to discuss with your daughter. See the Conversation Guide for tips. That’s great, it seems like your son has a good understanding of respect. It’s important to continue the conversation. See the Conversation Guide for tips. 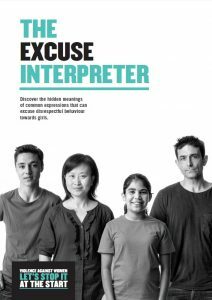 The importance of speaking out against disrespectful attitudes and behaviours. That male intimidation, humiliation or aggression towards females is never okay. These are important topics and issues to discuss with your son. See the Conversation Guide for tips. Start a conversation with your children about any of these issues you think are important. 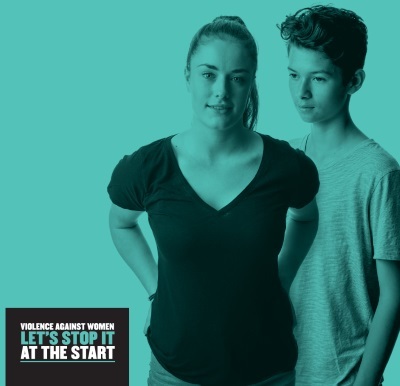 You may find that your son or daughter has healthy and positive attitudes, and the conversation is more about making sure they know how to be respectful, and understand right from wrong. Other issues might need more discussion. 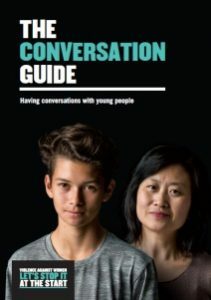 The Conversation Guide is a useful tool for parents who want to talk about respect with their children. It helps parents prepare to discuss sensitive issues and offers advice for having open and honest discussions.